Made by stop camera animation using collage elements . This video considers, with humour, an aspect of the human predicament: despite our desire to maintain youthfulness, we cannot escape inevitable changes. A woman exercises by doing stride jumps. As she jumps, she chants “everything changes, nothing’s the same”. Paradoxically by her repeated jumping, she seems determined, perhaps desperate, to defy change. At the end, she sounds resigned to accepting change. 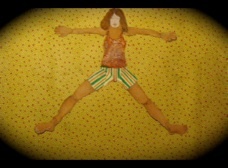 The video, with its vignette shot in low definition, and animated by stop camera animation, like the woman, seems resigned to becoming obsolete.